Do you want to activate an iPhone 6, 5s, or 5c on Ting? Do you know where and how to buy one? Here is everything you need to know. It is now possible to activate the iPhone 6, 5s and iPhone 5c on Ting’s CDMA service. If you want a new or used iPhone you must find one and buy it on your own as the Ting store only sells refurbished models. Another issue to contend with is the fact used models may have issues getting through Sprint’s new financial eligibility check (FEC) that places more stringent rules on what devices can be activated. Where Do I buy a Ting iPhone 6? Luckily, buying the an iPhone 6 or iPhone 6 Plus that will work on Ting is very easy. You can get them new directly from Apple. 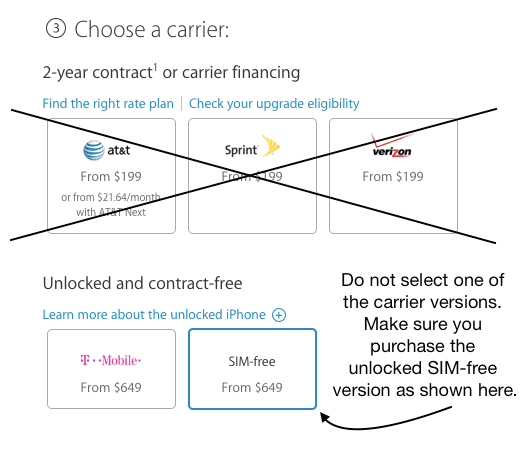 Simply choose the iPhone 6 or 6 Plus, the color you would like, and the “SIM-free” version (see image below), followed by your storage selection. This will ensure you get model A1586 for the iPhone 6 or A1524 for the iPhone 6 Plus. Both of those models will work with Ting on either the CDMA or GSM networks in addition to just about any other US carriers. Where Do I buy a Ting iPhone 5s or 5c? 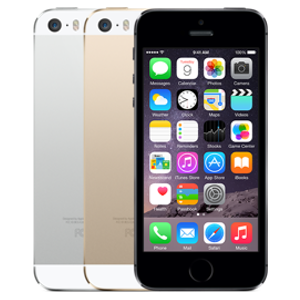 To buy a used iPhone for Ting CDMA you can get one from eBay, Amazon, Craigslist, Glyde, Swappa, or anyone who is selling a Sprint iPhone 5s or 5c that meets the following requirements. It must be a “Sprint” model: A1453 for the iPhone 5s, or A1456 for the 5c. It cannot be reported lost, stolen, or currently active on someone else’s account. Being eligible for activation and not reported lost or stolen is often expressed by sellers as a phone with a “clean ESN or IMEI” and “not iCloud locked.” If you are buying from eBay, Craigslist, and even 3rd party sellers on Amazon you need to make sure of this. It must not be under contract (not fully paid off). It must pass the MEID checker on Ting’s website. You must have a UICC SIM card installed for activation (this enables LTE data), model #SIMGLW416C, that you can buy directly from Ting here. Amazon – check out the “other sellers” section to see more selection and prices. Now that you have your iPhone, the next step is to activate it on Ting. If you are a new customer you can get a $25 credit to your account by using this link immediately prior to activating your first Ting device. How Do I Activate the iPhone 5s and 5c on Ting? Insert the Ting SIM card and then turn on the device. Go to https://ting.com/byod on a computer to begin the activation process. On your iPhone find the MEID and ICCID by going to Settings → General → About and scroll down until you see the MEID and ICCID numbers. Enter the MEID and ICCID when prompted and then follow the instructions to port in your existing number, create a new number, or swap out an existing device on your account. Are you still having trouble or not sure what to do? Ask in the comments section below or go to the official Ting iPhone FAQs page. If this page has been helpful, please share it or hit the +1 button below.